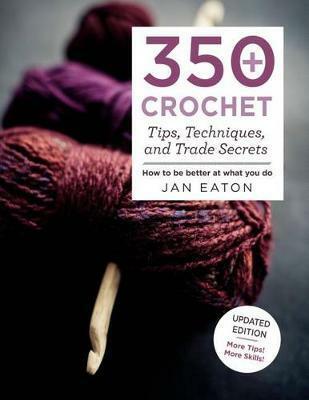 350+ Crochet Tips, Techniques, and Trade Secrets : Updated Edition--More Tips! More Tricks! Give a professional finish to your crochet garments and accessories with this indispensable compendium of technical know-how and troubleshooting tips. Techniques are organized in the order that you'd need them as you work through a project, from choosing the right yarn to looking after your finished garment. Step-by-step photographs, diagrams, and clear instructions guide you through each stage of your work, or you can dip in for help with a particular problem. Discover how to substitute yarns and accurately estimate the amount required, adapt patterns to create tailor-made garments, and lengthen an existing piece with trims and edgings. From basic chain stitches to filet crochet, there's advice for all kinds of stitches, mixing and matching, and dealing with gauge variations. You'll also find plenty of inspiration for adding an extra-special touch to your work using beaded embellishments and surface crochet! JAN EATON is known internationally for her specialty in needlecraft and textile designs. She is the author of 200 Crochet Blocks for Blankets, Throws, and Afghans.